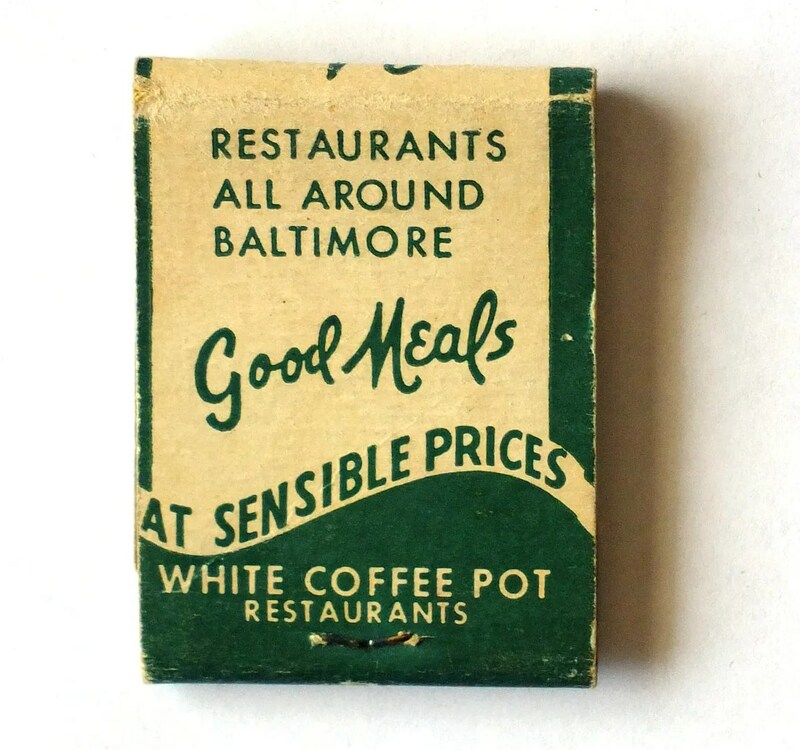 This entry was posted in Diners / roadside related, Diners/ restaurants and tagged 24 hours, Baltimore, ephemera, Little Tavern, Maryland, matchbook, MD, restaurant, retro, Vintage, white coffee pot, White Coffee Pot Restaurant, White Tower by Spencer Stewart. Bookmark the permalink. My brother, Sean and I would sing the White Coffee Pot Jr. radio jingle all the time when we were kids. We still sing it. I worked at their store in Hagerstown, Md., and opened and managed their new store in the LaVale Shopping Center in Cumberland. Great chain, open 24/7 with a nice selection of food. I am pretty SURE they now have stores operating as CACTIS WILLIES but the menus, etc. are very different. Interesting. Did not Cactus Willie’s had a piece of the White Coffee Pot “Action”. My mom and her sister worked for them for over 30 yrs..I have an ashtray and 2 pins w/their logos..The ashtray is green and says,”White Coffee Pot Restaurants – All Around Towm” I loved their hotcakes..Have since not found any that could compare. On corner of light street 69-71,- always tea time,nice getaway the waitresses were great. I WORKED AT THE WHITE COFFEE POT ON BROADWAY, AND TWO ON EASTERN AVENUE IN HIGHLANDTOWN. THE FOOD WAS GOOD AND SO WERE THE TIPS. My Mother work there many years along with a few of my sisters i was a baby but my mom was jean bentley my sisters were liz and darlene and june i think my older brother might of been there to sam bentley .i have good memories of that place good food! My grandmother, Naomi Gutzat, worked at the one in Pimlico. 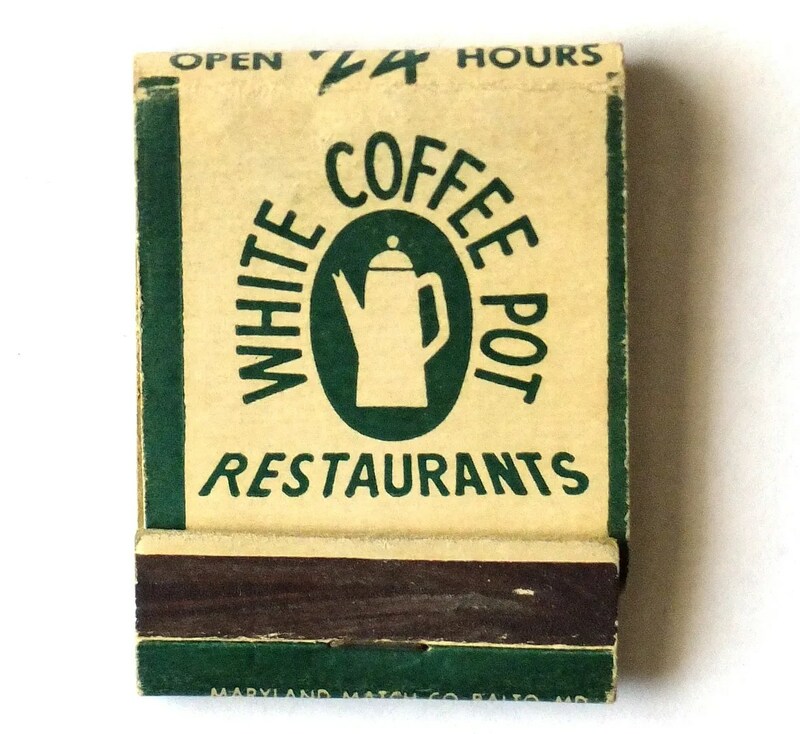 In Westminster, Maryland back in the 1970’s there was a White Coffee Pot Jr. in the 140 Village Shopping Center at the corner of Route 140 and Route 97. It’s now a Friendly’s Restaurant. I remember that they had very inexpensive chicken dinners and the BEST French fries ever. I’m sure what they fried the French fries in but they had some sort of coating on them and they were fantastic. I used to ride my 10-speed bike over there from my house just to get some fries. Does anyone know what they cooked them in? By any chance do you know what the brand of Green Goddess Dressing that was served at the salad bar at the White Coffee Pot Jr. The old White Coffee Pot has been on my mind lately, and I’m glad to see it’s the same for others. My mother used to take me to the one on Broadway when I was a kid in the early ’70s: I particularly remember the great cheeseburgers with delicious kaiser rolls. Sweet childhood memories, like ghosts from the past…. I remember going to the White Coffee Pot at the corner of Liberty Rd. and Windsor Mill road and the White Coffee Pot Jr further up on Liberty towards Randallstown. The White Coffee Pot Jr. sign is still there, but the building has been turned into a laundry mat.–good times, good times. Every time I pass the sign I remember they way it used to be. We have a doll, which we think is a waitress from a White Coffee Pot, maybe from the 1940’s. She is about 9 ” tall, in a gold uniform dress with white apron and black tie. We would love to verifiy that it is indeed a White Coffee Pot waitress. Anyone have the recipe for their French dressing? It was the best. I would also love to know what the recipe of that dressing was. A buddy of mine & myself used to saturate dinner rolls with that and eat it. This was back in the early 60’s! The French dressing was the best I have ever had in my life. Surely someone out there knows.where they got it or what the recipe is. Help, please. Anyone? I’ve been searching for that recipe would love to have it if you find it. Loved it . would anyone that use to work at any of them know the recipe or the brand of the gravy that use to be on the Hot Roast Beef? I am looking for gravy with the taste of White Coffee Pot on ham burger steak at White Coffee Pot . I am 75 and still looking for that flavor / taste from that time and place.